1 Recommendation is tagged with "lecture"
PhET simulations are free, online interactive simulations for teaching and learning science. 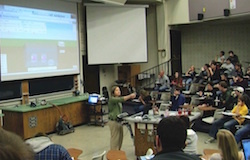 The impact of lecture demonstrations using PhET is greatly increased when students are given the opportunity to interact with the simulations. This article discusses facilitating student discussions, peer instruction, and interactive lecture demonstrations, with PhET.